It has been a very interesting ten days here in Israel, to say the least! First, Prime Minister Benjamin Netanyahu denied media reports that he was considering advancing national Knesset elections from late next year to sometime this year. Then several opinion surveys were published projecting that his Likud party would currently emerge as the largest one in the Knesset by far (the opposition Kadima party is slightly larger at present with 28 seats to the Likud’s 27), with Kadima losing around half its seats. The next largest party would be Labor with around 18 seats, or just over half what the Likud was projected to pick up (30-31). All this seemingly prompted the Premier to change his mind and order early elections after all—or so it seemed until today. It has now been revealed that even after a government bill was submitted to the Knesset yesterday for its dissolution this week, with new elections to be held on September 4th, secret coalition negotiations were going on between Netanyahu’s office and new Kadima leader Shaul Mofaz. The former Defense Minster (under Ehud Olmert) and Armed Forces Chief of Staff was only elected to the post late last month, defeating former Foreign Minister Tzipi Livni who had a very poor personal relationship with the veteran Likud leader. Although he often publicly criticized the popular Likud leader, Mofaz was known to be much closer to Netanyahu, quietly supporting his handling of the Iran crisis and other vital military issues. The two party leaders negotiated all night and surprised the nation (not to mention most members of the current coalition government) this morning with the announcement that Kadima has agreed to join a broad "National Unity Government" that will have nearly three-fourths of the Knesset’s current members in it. This will give Israel a coalition government of unprecedented strength at a critical time in the country’s short modern history. Given the instability rocking Greece and many other countries, this is a remarkable development for sure. 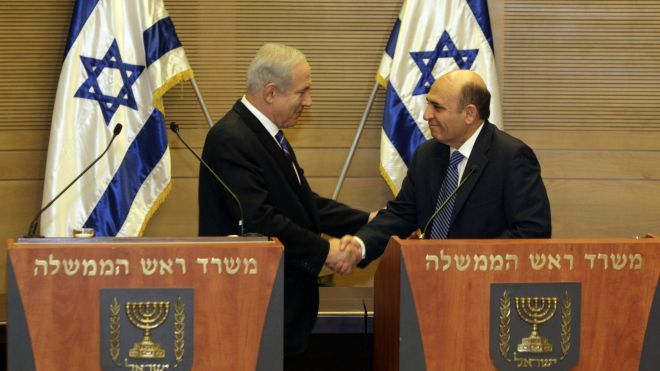 Shaul Mofaz will become "Vice Premier," which will increase his prestige and exposure before the next election. The two leaders have also agreed to introduce major political reforms that are opposed by the smaller religious and Arab parties, including a direct vote for regional Knesset candidates for a portion of the legislature (only parties are currently chosen, not individual candidates like in the US and elsewhere). Analysts say if this long sought after reform is actually enacted, it will undoubtedly reduce the number of Orthodox and Arab politicians elected to the next Knesset, further strengthening the large centrist parties and bringing more political stability to the country. Another promised reform would entail the drafting of almost all 18 year old Israelis into some form of public service, including most religious youth and Arab citizens. Political analysts are saying this afternoon that the new government reformation is not only a very dramatic and unexpected development, but probably means that an Israeli military strike on Iran is in the offing. Netanyahu would want as broad a government as possible if he orders his military forces into action against Iran, especially since this would probably spark off a major Middle East war. That in turn would increase political and economic upheaval not only here in the tense region, but in many places around the world. Still, Netanyahu knows that polls show a majority of Israeli voters back such action, given that the extremist Iranian regime is pursuing nuclear weapons while vowing to wipe the Jewish State off of the world map. Facing his own re-election this year, US President Barack Obama would probably be very unhappy with any unilateral IDF action, although his need for Jewish votes in key swing states like Florida might cause him to bite his lip. Indeed, many are saying that is another reason why Netanyahu feels the need to order a strike this year before the US ballot in early November, and early Knesset elections in September would have interfered with that reality. All this to say, the prospects of an Israeli military operation designed to sharply set back Iran’s nuclear program have vastly increased, literally overnight. Keep us in prayer as the shakings continue here in the region and around the world.